It is football season. 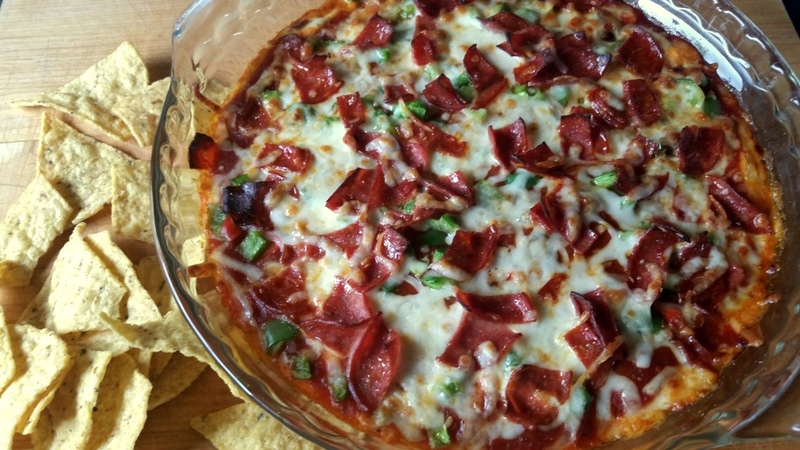 This pizza dip is a great snack to serve on those game nights. If you want to make it meatless you can use mushrooms instead of pepperoni. Use your favorite chips, breads, or crackers for dipping. Tortilla corn chips are my favorite for this dip. 1 cup pizza sauce or spaghetti sauce, I like to use either hot and spicy pizza sauce or spicy red pepper spaghetti sauce. Use your favorite. Beat cream cheese, sour cream, and mayonnaise until smooth and creamy. Stir in 1/2 cup mozzarella cheese. Spread into a 9" pie pan. Cover with pizza sauce, peppers and the rest of the (1/2 cup) mozzarella cheese. Top with chopped pepperoni and bake in a 350º oven for 20 minutes until bubbly and golden. Serve hot with tortilla chips, toasted baguette slices, or crackers.